Our off-airport parking at Luton is excellent value, convenient and fully secured. 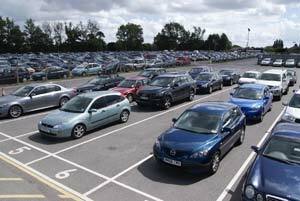 We provide one off-airport car park at Luton: Airparks Luton. Theres a reason why it's by far our most popular Luton airport car park. Off-airport car parks are located just outside the airport grounds, but, since we know how you value convenience, our car parks are never too far from the terminal. In fact Airparks Luton, our only off-airport car park, is just four miles from the airport and you can get there with a quick 12 minute transfer bus, which runs every 20 minutes. By parking at an off-airport car park you can save yourself money, happy in the knowledge that your car is safe and that well get you to the airport with no problems. On-airport car parks are located within the airport grounds, but often still require you to catch a transfer bus - that's the case with two of our on-airport car parks at Luton, Luton Long Stay and Luton Mid Stay. Why book off-airport parking at Luton with HolidayExtras.com®? Were proud to offer really low prices for our Luton airport parking and with parking costing from just £5 per day you can see why. It makes sense to book in advance with us - if you don't, and just pay when you arrive at the car park, it'll always cost you more. At the moment if you turn up and pay for your parking without pre-booking itll cost you £10 per day, book early and youll pay half that. Our Best Price Guarantee covers our parking packages because we want you to be sure youre getting the best price - if you find your Airparks package on sale cheaper somewhere else, well give it to you for free. We know that safety is a top priority when leaving your car. So Airparks Luton is fully secured and holds the ParkMark®, a national security award accredited by the Association of Chief Police Officers. It's covered by CCTV, patrolled 24 hours a day, fenced, floodlit and protected by entry and exit barriers. 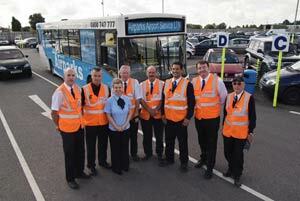 Airparks Luton offers a service called Return Greet, where you can have your car brought to the terminal for you when you return from holiday, so instead of catching the transfer bus with everybody else, you can set off home straightaway. If youd like you can even have your car cleaned while you're away. Youll be happy to hear that transfers between Airparks Luton and the airport run 24 hours a day and are included in the price. So no matter what time your flight well be there for you.